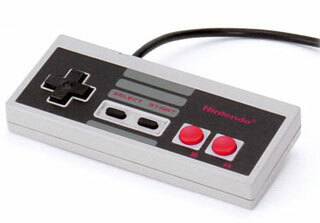 A NES controller, "that ergonomic nightmare"
It all started when I got that damned Nintendo. If you lived through the '80s, you had one of these things—that gray box with the unblinking red light, the ridged cartridges that fit in oh so snugly as you pushed down—chink, ka-chank. And that controller—that ergonomic nightmare. That little boxy thing that bent your hand into claws as you clicked on the black cross and the red springy buttons, your hand aching and bent back in misery. The cramps, the eyes glazing over from hours of staring at oversized pixels leaping across your television in eight-bit glory, your whole body stiff from sitting in one place for way too long. But see, the regular video games weren't enough, not at first, not for me. They were just the tip of the iceberg. Mario would only carve a few hours out of my day. Same with Galaxian , Life Force , Metroid , or Castlevania . I played for an hour or so, got bored, and then read some books or went outside to play. It wasn't until my Nintendo met Ultima 3: Exodus , that my life changed. 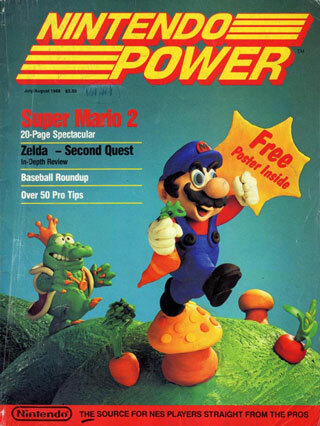 I remember reading a review in some magazine that compared it to Zelda . This was nothing like Zelda . Zelda was an action game, it had puzzles, it was rigid and without plot. The exploration was simple, basic, the characters all said one line. Not so with Ultima 3 . I created four heroes, tiny pixel-adventurers, each with statistics, each ready to go out and save the world from evil. But the level of detail in the world was astonishing! Characters would tell you about their children, and your heroes could catch a cold or pneumonia. You could buy horses, sail a ship, travel into dungeons beneath the world. The exploration, the adventure—it captured my imagination like no other game before it. From this point on I was hooked. No other video game would do. I was captured by RPGs (role playing games—video games based on the ilk of Dungeons & Dragons ) and there was no going back. No other game provided the sort of freedom that I craved, the sort of world design that I loved. Next was Dragon Warrior —the start of the longest running video RPG series, ever. I got it for free with a subscription to Nintendo Power magazine—secretly, I bought the subscription to get the game. I sat down with it immediately and got sucked in. I don't think I ever got past the Rainbow Bridge, but like with Ultima I was hooked. Final Fantasy came next, and with it came the biggest punch—a game with a story line, with plot sequences, with little animations that played out, telling you about the world and its inhabitants on a grander scale. My friends and I would sit around and play the game day and night, passing the controller back and forth. You had four characters in a party, and each of us was playing a different class. I was always the Red Mage—a combination of a Fighter and a Wizard. When we were done playing we would head outside and act out the adventures we had done on the screen, toy swords in hand, dressed as Fighter, Black Mage, Red Mage, and Thief. After that came the three Dragon Warrior sequels and Ultima 4 for the Nintendo. These games were more advanced graphically, had more intricate rules in combat, and more realistic detail in character design and world design. There were unlimited characters who would join your party, multiple endings, multiple ways of solving the same puzzle. And I went back, playing each part of the game over and over again, seeing how many ways I could do the same thing. The hours ran around in my brain, creating memories out of video games, moments that I shared virtually with my friends when they came over. We kept index cards of our characters, discussed deaths, rebirth with healing potions, level design, which games had better characters and equipment. We used graph paper to design our own games while we waited for the next one to be released, playing a version with cardboard characters and enemies we had carefully cut out and painted by hand. We would spend hours at one another's houses, designing our own dungeons and monsters, reading magazines with reviews of our favorites, and waiting for the next adventure. We replayed the classics from time to time, tackling the same enemies over and over again, shrieking with joy when we discovered some hidden gem that we had not found the first few times we had played through. And then—for Christmas I got the next step up in home video game power. I got a Sega Genesis. It only had one RPG, compared to the virtual army of them that existed for the Nintendo. But what a game it was— Phantasy Star 2 . It was vastly different than any of the other games we had played. For one thing, it took place in the far future, and had graphics similar to Robotech . This was a huge a bonus for me—the one thing I did not like about most RPGs was the medieval setting. I was a big science fiction fan—I grew up on Heinlein's juveniles and was part of the Star Wars generation. The next big change was that the other characters who joined your party had an AI system for combat. So each of them had a unique personality for fighting, one you had to work with when going into combat. The graphics were powered by the Genesis's 16-bit processor (2x as much as the Nintendo! Eat that, you old gray box! ), and it looked just like an arcade game. And we were blown away. I think we played this game more than any RPG before it. The music still haunts me; I still hear the level-up music at random points in my day, even as a grownup. We devoured the next two games— Phantasy Star 3 and 4 . 3 was immense! Your characters would marry (according to your own choice—the spouse was not predetermined) and would have offspring, and then you would play the children. The game continued through three generations, and each time you played it, it came out completely differently. Also, it had darker, more sinister artwork than Phantasy Star 2 . The world felt sinister, and the graphics were a leap above the others. The combat was still the same (as it is with almost all other RPGs), but that didn't bother us. We played, we played, until we fell asleep on the controllers. Phantasy Star 4 was more like Final Fantasy —a plot-based game. It was futuristic, like the others, but felt like it was missing something. The game felt too easy, too plot driven, and we felt cheated. We almost gave up on playing any new RPGs, when suddenly I got a Super Nintendo for Christmas. This was Nintendo's answer to the Genesis. And with it came powerhouse RPGs—ones that were more plot driven, but also contained great graphics, great gameplay, and the challenging atmosphere and replay value that we adored. And Squaresoft was the king of video RPGs. 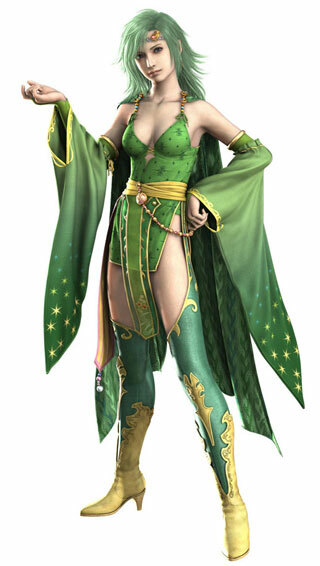 Final Fantasy II had my first cartoon crush. Rydia. I drew pictures of her idly in class, dreaming of her. Yes, I am a super-geek. I was in love with not just a cartoon character, not just an anime character, but one who existed in a video game. I am a sad, sad man. Then came my first experience with steampunk— Final Fantasy III , the granddaddy of them all, filled to overflowing with steam-powered mechas, Victorian-influenced villages and clothing, an industrial backdrop, and vivid characters. It pushed so many boundaries for video RPGs—it (like Phantasy Star 3 ) was among the first to swap main characters during the game; it was the first to combine elements of action games with a turn-based combat system, the first to create a plot rooted in philosophy as well as action and adventure. Many '80s and '90s console RPGs have been rereleased for newer platforms. Chrono Trigger DS (above and below) has hit shelves in the past two weeks. How could this game be topped? How could an RPG get any better than this? 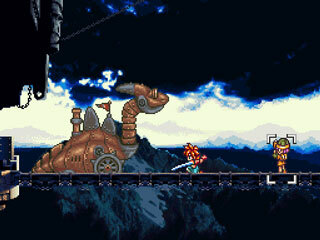 Chrono Trigger . This is the game that launched my voyage into programming. Chrono Trigger had thirteen possible endings to its main plot, each unique, and over a hundred permutations with subplot endings. 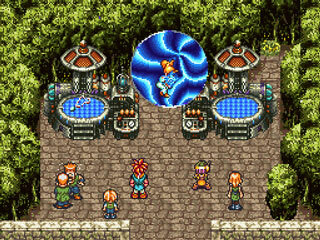 Chrono Trigger 's story changed as you played, yet stayed brilliant, involving, and unique. Chrono Trigger was a time travel RPG that completely bent back anything you understood about how these things should play. After playing Chrono Trigger , I went to the library, where they had one computer (one!) that was hooked up to the then newly found Internet. I browsed GeoCities pages, looking for other fans of this game and others, and found instead a community of programmers—people, using software that was free, creating games that looked and played just like these RPGs. I had to learn. I had to figure this out. I learned QBasic (the language of choice at the time) in about a week; I learned techniques in making an RPG even faster. New terms became a constant part of my vocabulary—Tile Engines (named for the tiled background in most RPG worlds), sprite engines (the images of good guys and bad guys on the screen), combat systems (turn-based, real-time, etc. ), and plot scripting (creating a scene in the game to reveal the plot). I now spent nights not only playing video games, but also creating them. I could never play RPGs the same way again. Instead, I looked for ways of replicating the cool stuff they did, pausing the game and staring at each pixel, looking at how they made the graphics piece by piece. We swapped games online, talked about different ways of making the games faster, easier, better. This was no simple task, back in the days when 486 processors were still common. We learned C++ and used new programming tools with cool names like Allegro and DirectX. But the games sped beyond my capabilities. I bought a PlayStation, and played Final Fantasy VII , VII , and IX . I played countless other RPGs—games like Grandia , The Legend of Dragoon , and Chrono Cross . I was drowning in the games, trying to keep afloat, trying to keep everything cool and sane. But I could not compete. The graphics were too advanced, making my pixel art look archaic. There were too many RPGs, and I could not play them all. I bought and bought but found no release, found no brilliant calm of fun that I had once felt. Others felt this way, too. People online stopped making RPGs. When the PlayStation 2 came out, there were far fewer RPGs for it than for the PlayStation. The world had gotten sick, if only for a little while, of being a Red Mage, a Fighter, or a Thief. Yet, I still hear the music of the old games, the games of my youth. I still remember the days of being a Dragon Warrior, of being a Red Mage fondly. Very, very fondly. I remember with nostalgia and bliss the years I tried to race to build my own game. It ended too soon—all things come to an end way too soon. Yet, in the odd hours of night, when I can't sleep, I fire up my old Nintendo (and yes, it still works—jealous? ), my old Super Nintendo, my Genesis. I pull out the games, dust them off, push them in. I still feel a thrill when they click in, just right, and the theme music comes on in warbly, eight-bit glory. And I am a Red Mage, again. Fighting through the mazes beneath the elven city. Wandering through the dark skies in my airship, looking for the elusive evil elementals who are eating at the land. Fighting the Dragon Lord, and becoming the Dragon Warrior. Paul Jessup (paul.jessup@gmail.com) has been published in many magazines, including Clarkesworld Magazine , Apex Digest , Fantasy Magazine , Farrago's Wainscot , Post Scripts , Electric Velocipede , Pseudopod , Flashing Swords , Nanobison , Journals of Experimental Fiction , Jacob's Ladder , and The Harrow . Currently, he is a content writer for What It Costs , an editor for Behind the Wainscot , and a reviewer for Apex Digest . He is also the recipient of the 2000 Kent State University Virginia Perryman Award. Two books by Paul are coming out in 2009. PS Publishing will release his collection of short stories, Glass Coffin Girls , as part of their PS Showcase series. Apex Publishing will put out a surrealistic space opera novella. For more information, visit "Worlds of Paul Jessup."